Just when you feel like there’s no hope left in the world, and the constant barrage of negative news about the earthquake in Japan and the looming radioactive death storm is getting you down, at least we can count on FOX News to lift our spirits. In a map of nuclear reactors in Japan, they mistakenly managed to list music hall SHIBUYA EGGMAN as one atomic site. Well, no wonder we haven’t had any black-outs in Tokyo yet. We owe it all to those secretly hard-working nuclear power plant employees at Shibuya Eggman. Also the map seems to indicate that the 9.0 earthquake also moved the town of Sendai （仙台）about a thousand miles to the southwest. There is actually a power plant in Kyushu called the Sendai （川内）power plant. Different kanji. Kudos to Fox News for getting that right. 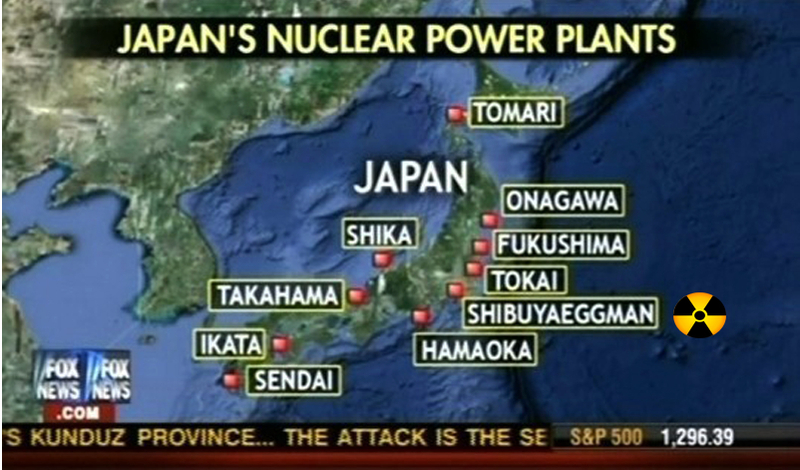 Fox News Reveals Secret Nuclear Power Plant in Tokyo Disguised as Music Hall! Eggman is an established music hall/night club in the Shibuya ward of Tokyo that is reopening tonight with a concert that should lift some spirits. I think I may go and offer a toast to the hard-working volunteers helping to provide relief to the survivors and a moment of silence in mourning for the loss of responsible journalism and so much more. The Eggman official site lists a very touching tribute to the victims of the earthquake and in very small letters makes an amusing comment on the whole incident in English and Japanese. The spelling of “powered” is slightly off but less so than the reporting of Fox News. Shibuya Eggman has no nuclear plant. Our electricity's powered only by music. Maybe Fox News should changed their slogan to: Fox News: Fairly Unbalanced News. We mis-report, you deride. Well, what can you expect from a company owned by News Corporation–except the finest in journalism. By the way, did you know News Corporation also own a controlling interest of National Geographic Television (the generally accurate documentary channel)? Just thought I’d mention that. For the illumination of our readers, here is an English map of nuclear related facilities in Japan, provided courtesy of Kyushu Denryoku. 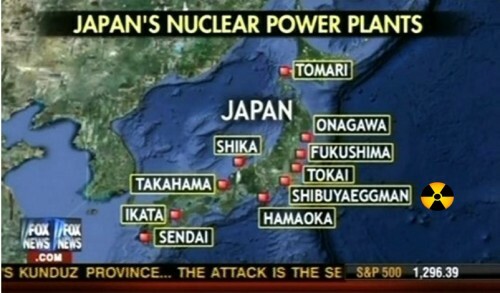 Notice that Shibuya Eggman Reactor has been completely removed from the map after the devastating report by Fox news was broadcast to the world. While some claim that the reactor doesn’t exist there, there have been credible reports that it is behind the takoyaki (fried octopus) stand near the entrance. Albeit, a very small nuclear reactor which also appears to be powering the takoyaki stand as well. Media Matters was probably the first blog to pick up on this breaking story, although they seem to cast aspersions on the credibility of the Fox News report. I might not like the political leanings of FOX news and I do feel that their news coverage is not fair and balanced at times, but I also know there are journalists there striving to do their best. So jokes aside, I wish them luck and hope they find some capable Japanese journalists to help them out. Brian Ashcraft at Kotaku.com also has a nice piece on this story and how the desertion of Japan by the foreign press has sown the seeds of misinformation. Andy Levy From FOX on the Shibuya Eggman reactor story. Read from the bottom up. 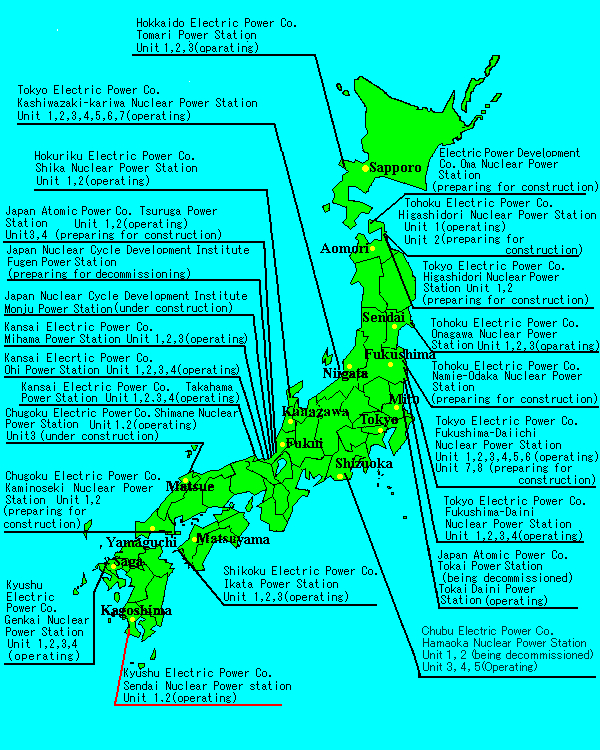 Nuclear power plants and facilities in Japan. Redacted by Japanese corporation, clearly. Shibuya Eggman Nuclear Power Station conspicuous in its absence. Don’t be messin’ with their reporting by throwing “facts” out there. LOL Fox has never been known to be bothering with facts, why start now? Great – Thanks for the laugh! Sendai is a city in Kagoshima prefecture. Sendai has a nuclear power plant. You should correct that or you’ll get embarrassed. Otherwise, great work and I enjoy reading your stuff. Thanks! I just assumed they were totally off. 仙台市(Sendai) and the 川内（Sendai) Power Plant. Japanese without kanji is confusing. Nice to see the folk at the music hall have a sense of humor :D! So, in the middle of “the looming radioactive death storm,” you still find time to hate FNC. Yeah, THAT’S professional. Lone Ranger, I don’t hate FNC. And there isn’t a looming radioactive death storm in Tokyo other than the media hype. In the midst of tragedy, we all need a laugh now and then. 泣いて暮らすも一生、笑って暮らすも一生。I had a very exchange with Andrew Levy at Fox News and wished him and his team my best. I’m hoping this was a glitch in the program that generates their graphics and no human journalist was responsible for such errors? I see such a chance to make a cruel joke here but I shall refrain. If you can figure out how that ended up there, I’d be impressed. The problem is that a lot of News International-owned media has a problem with fact-checking – The Sun’s multitudinous trips to the libel courts being a case in point. Also, when you sell yourself on being ‘fair and balanced’, you do rather make a rod for your own back. Plus, NI has considerably more resources and editorial oversight than, say, the JSRC – in this case, there’s simply no excuse for such poor quality output. I think Fox has dropped the moniker “fair and balanced” and is now calling themselves “the most trusted news source in America.” And they may very well be the most trusted news source for their core audience. An embarassing mistake from Fox and one which deserves a few laughs. Hopefully this makes them a bit more careful when it comes to checking information. Though I wouldn’t be counting on it. Previous Previous post: How dangerous is low-level radiation? Perhaps, much less riskier than we think. Next Next post: One of Japan's largest festivals, the Sanja Matsuri （三社祭）officially cancelled.